Hard to believe that a motorcycle can fit on a razor blade. Steven Leahy shows how he uses a miniature stencil, airbrush, paint brush and gold foil to paint a miniature Harley. And boy does it look like the original. US artist Jürek has the utmost respect for nature and all four-legged friends. In the tradition of the Dutch masters, he creates an impressive tiger portrait with realistic pelt structures and expressive eyes. One almost gets the impression of staring right into the predator's soul. Creating a successful drawing based on a photograph is not all that simple. The techniques used to create forms and contours as well as realistic proportions for the human face are explained by Dave Nestler in light of a detailed pencil sketch. Maintaining your coolness at a bodypainting competition is an artwork in and of itself. At the World Bodypainting Festival, Flavio Bosco magically brought about a color-happy motif on the body of his model and promptly took third place in the competition. Designing one's own four walls via airbrushing is surely the dream of many artists. Team Witti-Design designs a Mediterranean backdrop with a view of the sea which places the observer right in a holiday mood. This is how you turn a lovely vacation memory into a dreamy airbrushing motif: David Naylor puts a lot of love into creating the details step by step for an old Chevrolet that he caught on his camera while on vacation in Havana, Cuba. US artist Jürek tells us even more about his artwork and provides us with some inside looks at his career path and his life philosophy. 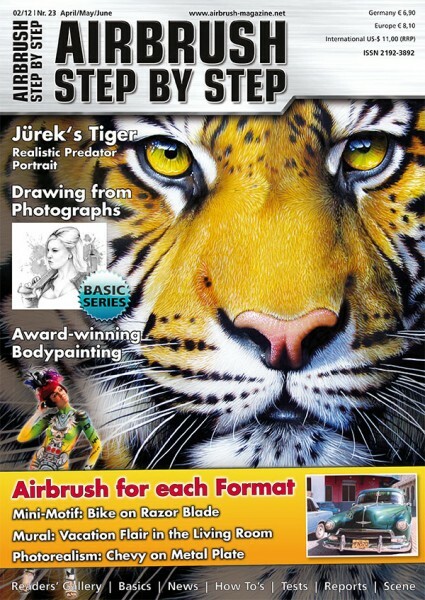 Related links to "ASBS Magazine 02/12"
Customer evaluation for "ASBS Magazine 02/12"